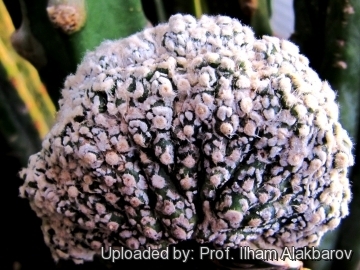 Description: Contrarily to the normal Astrophytum asterias cv. Superkabuto that has only a mosaic of small spaced ± rounded white dots the “snow type” differ for the dense white covering of dots that almost conceal the epidermis, this particular form is also called "Snow white", or “White form”. This intense white covering is not seen in most of the normal 'Super Kabuto' seedlings and will change and emphasize as a plant ages. Crested form: The crested form (Astrophytum asterias var. nudum f. cristata) - despite to its beauty - is very rare and sought after by collectors, for its unique features. It is a small low growing crested cactus that will slowly forms tangled groups up to 30 cm (or more ) in diameter with age. 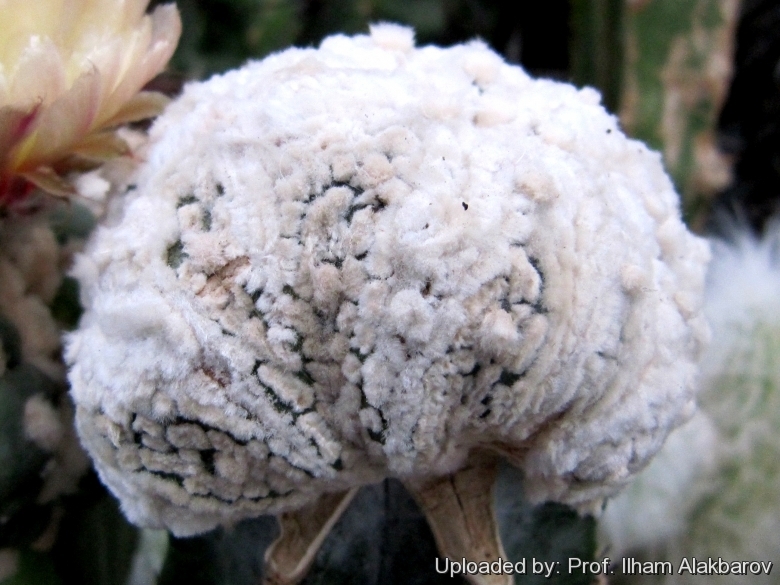 The plant tends to grow seated in substrate, but in cultivation it is almost always seen grafted on columnar cacti. There are several crested clones mainly selected by Asian growers. Habit: It is usually solitary unless damaged. Stem: Much depressed, fan-shaped, mature plants 2-7 cm tall, 5-16 cm broad, smooth completely concealed by tufts of bright white hairy scales. Ribs: The ribs are very low, almost flat on top, forming triangular sections with no cross-grooves. Areoles: Round, prominent, 3-12 mm in diameters, forming a line up to the centre of each rib, felted to hairy, white till straw-coloured, then grey. Normally 3 to 10 mm apart. Flowers: Apical, diurnal, radial, 3-5 cm long, 5-7(-9) cm in diameter opening widely, yellow with orange/red throats. Blooming season: Spring to summer and each flower lasts for one or two days only. Cultivation and Propagation: Although regarded as a choice and difficult plant is not too difficult in a greenhouse, but grows quite slowly. It is sometime seen as a grafted plant but grows on its own roots too. Use mineral well permeable mineral soil with little organic matter (peat, humus). Water sparingly from March till October (weekly during summertime, if the weather is sunny enoughand) , with a little fertilizer added. keep perfectly dry in winter at temperatures from 5 to 15 degrees centigrade. (but it is relatively cold resistant and hardy to -7° (-10°)C for short periods) In the rest period no high atmospheric humidity!! They need a good amount of light shade to full sun this help to keep the plants healthy, although slow growth. Be careful: The epidermis of Superkabuto is harder than in the normal asterias and cracks easily if plants are overwatered. Propagation:*** Grafting or cuttings. Plants are usually grafted onto column-shaped cacti but proved to be able to produce their own roots if degrafted.